When I first set out to write this article on our native bittersweet, I immediately thought about the Haudenosaunee creation legend. As part of this Iroquois tale, Skywoman (who created our known earth) conceives a daughter who gives birth to two sons-one benevolent to nature and the other set out to destroy the Creator's works. In the literature, the two sons are often nicknamed 'good' and 'evil'. I see a parallel with our two local Celastrus species. Our native species is C. scandens, i.e. the 'good' one, and the 'bad' is C. orbiculatus, an agressive alien look-alike that is slowly extirpating our native species. These members of the Celastraceae family are twining, perennial, climbing vines. While both can obtain impressive heights if a suitably tall structure is present, C. scandens rarely grows more than fifty feet tall while C. orbiculatus, the Asiatic bittersweet, can achieve heights that exceed eighty feet. This growth form makes the latter capable of destroying large trees through girdling and shading. The bittersweet vines produce small, greenish white, flowers in early summer. The leaves are simple, ovate, alternate, to 4" long with serrate margins. 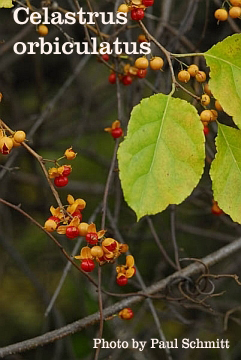 By late autumn, the leaves turn yellow and the fruits that appear give the plant its aesthetic appeal: clusters of reddish-orange capsules surrounded by three orange-yellow lobes. Although similar in appearance, the best way of differentiating them is to compare the fruit structures. In our native species, the fruits appear at the end of the stem as terminal panicles, each panicle about the length of a leaf. 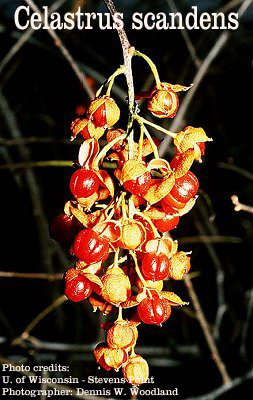 In the Asiatic species, the fruits are much more numerous and appear along the stem in axillary cymes. Studies show that our native species is being replaced by C. orbiculatus. There are numerous factors that give the latter an advantage: It grows more agressively, has higher pollen and seed viability rates and overall higher seed production since it bears fruit all along the stem. More subtly, it hybridizes with our native species. The fruits of both persist into the winter months, making them an attractive indoor holiday display and a welcome food source for some of our local birds. If you find the non-native variety and decide to use it for a holiday setting, please properly dispose of the plant afterwards. 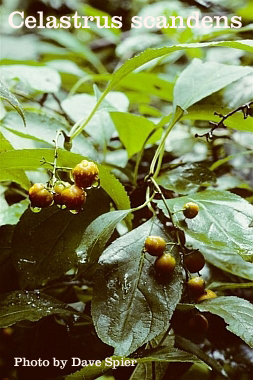 For more information about the Asiatic bittersweet, visit the Invasive Plants section of our website.